Here we tap into real you, delving into purpose, passion, meaning and connection to yourself and the things that are greater than you. I talk about flow a lot, but what does it really mean?? “In positive psychology, flow, also known colloquially as being in the zone, is the mental state of operation in which a person performing an activity is fully immersed in a feeling of energized focus, full involvement, and enjoyment in the process of the activity. In essence, flow is characterized by complete absorption in what one does, and a resulting loss in one’s sense of space and time”. Have you ever had those times when you are so deeply immersed in something? Something that excites you, it feels fun and just completely grabs all your attention? Well what if you could get into that state on a daily basis, and in all ofthe things that you do, well for ‘most’ of them at least. So that you can get more done in your day, being proactive, taking action and feeling good about doing it. And that’s the key here is feeling energised about living your day rather than feeling exhausted by it. It would feel pretty good right? This has been something I have been working on always creating more of, in fact it’s a question I often ask myself in my journaling, ‘how does this get to feel like ease and flow’ and just notice what comes up for you. 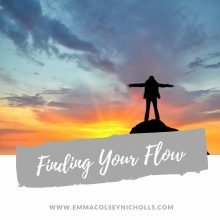 Now of course we are all individuals and I encourage you to discover what flow looks like for you, but i wanted to share the 3 main concepts that help me find my flow. The next is intention, getting clear about what you want for the day, for the week, what you want to get done and how you want to feel about doing it. I do this through my daily journaling and planning sessions that are now part of my morning routine. I set myself up for the day. Writing down what I want to get done but also tuning into the feelings around how I will ‘feel’ when doing those actions and what they are going to help me achieve. Especially the things that you kinda have to talk yourself into a little. The final one is interlinked and they are your habits and routines. Habits and routines in essence are your flow. You see once something becomes habit it’s sooooooo much easier to fit in other things, new things you get to add into your life. So coming back to morning routine, this is something I have developed over time BUT when I first started getting up early it kinda sucked. I was tired, a bit groggy and I just wanted to be in my bed. But I now have my morning routine finely tuned that I’m actually excited to get up and out of bed in the morning. Because I know that in doing this, I start the day with the best foot forward. I run the day instead of it running me. When starting to develop new habits of your own that will improve your life and your personal development, be patient and sure to take them one step at a time. Adding a new habit can be tough at first, you will have resistance to it BUT once you cement it in, not only do you start to enjoy it, but that is when the feeling of ease and flow creeps in, because it just becomes one of those things that you do. you just get on with it and do it as one of those things you do each day. So start to think about what habits you are going to start implementing this week. And remember just take it one step at a time. Pick one, the one that feels like it would add the most benefit to your life right now and start implementing it. Hit reply and let me know which one you are going to start doing more of, I would really love to know. Here is to finding your flow this week. PS – If this work is inspiring you to take BIG action. CLICK HERE to check out the details on my one to one coaching when I guide and support you through this entire process and help you to create more ease, flow and awesomeness in your life.